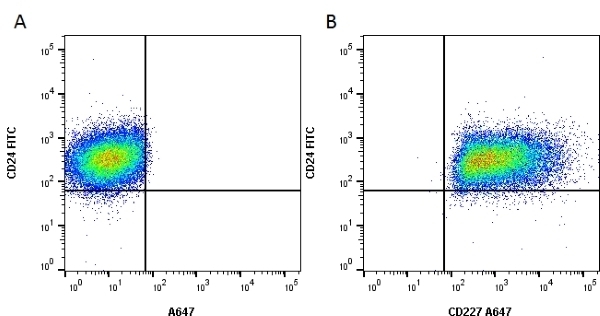 Rat anti Human EGF Receptor antibody, clone ICR10 recognizes the human epidermal growth factor receptor (EGF-R), which is over expressed in a high proportion of breast cancer cells and in a range of other carcinomas. High level expression of EGFR is often associated with advanced disease and poor prognosis. Rat anti Human EGF Receptor antibody, clone ICR10 binds to epitope B from EGFR (Lottaz et al. 2010 and Modjtahedi et al. 1993) and has an affinity of 6.7 x 10-9 M.
Extracellular domain of human EGF-receptor from head and neck carcinoma. Modjtahedi, H. et al. (1993) Antitumor activity of combinations of antibodies directed against different epitopes on the extracellular domain of the human EGF receptor. Cell Biophys. 22 (1-3): 129-46. Polymers for Advanced Technologies. 24 (3): 294-299. Gilcrease, M.Z. et al. (2009) Alpha6beta4 integrin crosslinking induces EGFR clustering and promotes EGF-mediated Rho activation in breast cancer. J Exp Clin Cancer Res. 28: 67. Tilburgs, T. et al. (2015) Human HLA-G+ extravillous trophoblasts: Immune-activating cells that interact with decidual leukocytes. Proc Natl Acad Sci U S A. 112 (23): 7219-24. Tilburgs, T. et al. (2015) The HLA-G cycle provides for both NK tolerance and immunity at the maternal-fetal interface. Proc Natl Acad Sci U S A. 112 (43): 13312-7.